A very different book came across the reviewer’s desk this week. Monk in the Mountain (ISBN 978-974-7512-57-1, published by Tam Song Ta Meditation Sanctuary, 2007) is a question and answer book with a profound difference. The book has been written by Ajahn Sumano Bhikkhu, an American Buddhist monk who has been living in a cave in Thailand for over 19 years. During that time of personal contemplation, he has not cut himself off from the world as we know it. In fact he uses a battery powered lap-top computer and is aware of the big world ‘out there’ even if he does not wish to be part of it. However, it is his experience of ‘our’ world that makes his answers so pertinent to today’s troubled questioners. By the way, ‘Ajahn’ means teacher, ‘Sumano’ means good heart and ‘Bhikkhu’ means one who is striving to come to the end of the world. 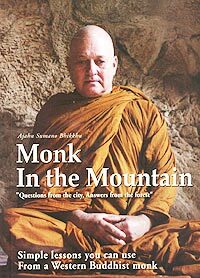 Ajahn Sumano Bhikkhu is a ‘thudong’ monk, one of the wandering monks who live in the forests and are involved in deeper meditative practises, following very strictly the 227 rules as set by the Buddha himself. Ajahn Sumano Bhikkhu admits to fear in living in his cave, which he shares with lizards, scorpions, bats, rats and the occasional hungry, rat-starved cobra. This type of existence is a far cry from his previous life in America, growing up in Chicago, university, law school, marriage, divorce and a business. He was in his mid-30s when he began his search for spirituality, eventually ending up in his personal cave and is now 67 years of age. The book stems from his compiling the questions he has been asked, both directly and via email (monksu [email protected]), and then publishing the questions and answers in book format. I wonder if the Buddha ever imagined his teaches could be discussed over the internet? Being himself mortal, worldly experienced and devout in his beliefs, the answers he gives to the questions are obviously slanted towards Buddhist beliefs, especially that of ‘karma’, that very deep concept that is a lynchpin in Buddhism. The subjects covered in the questions and answers are varied, but do relate to life and living in today. At B. 495 it is an inexpensive trip into the deeper thoughts of a Buddhist mind. Though not personally a Buddhist, I found this book very thought provoking, and since we have chosen to live in a predominantly Buddhist country (as has Ajahn Sumano Bhikkhu) it behoves us to try and understand a little more about our hosts, and at the same time perhaps understand a little more about ourselves.